I come from Ireland where there are many small Montessori schools. As a teenager I baby sat the children of Montessori teacher and she told me about Montessori. When I left school I decided to begin Montessori training in Dublin. During my training I began to realise that I hadn’t really understood what I was enrolling in. But the more I found out , the more intrigued I became. I love how Montessori education is adaptable for all learning styles and how, if you truly follow the practice of ‘Follow the Child’, Montessori is for everyone. The holistic nature of Montessori really appealed to me and then there was the fun discovering aspects of sensorial, maths or language etc. to share with the children but which I often first had to discover myself. I learnt a new found appreciation for the world and for learning which the teacher in me just wanted to share with others. Incidentally that has also been one of my biggest challenges; to let the children make these discoveries and not get so caught up in sharing mine! I graduated with Association Montessori International 3-6, 6-12 ands Special Needs Diploma. After I came to New Zealand to teach I also completed Diploma of Early Childhood Education. 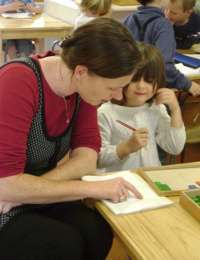 I first started teaching in 1994 and have been involved in Montessori ever since. I spent one year teaching in Canada but apart from that my time has been spent at New Plymouth Montessori School in a rural area of New Zealand. Montessorians talk about the three year cycle for children but I also believe teachers should also spend at least three years in the one class. Each year your development moves into a different plane. The first year you are so focused on the details and often there is too much freedom in a class, but so much passion. In the second year, you can see a wider picture – you also live by your successes and your mistakes – and not by those of the previous teacher as you can do for much of the first year. By the third year you have experienced most of the day to day events in a school, the leaders in the class are those you started as three-year-olds and hopefully you are finding your stride. It is then that teachers can focus more on the school rather than their class and so starts a new plane of development! In 2005 I took over as principal of New Plymouth Montessori School and started a new cycle, this time focussed on the tasks as a principal rather than a teacher. While I still love working with children, along the way I have found the joy of watching and supporting growth and development of all the teachers in our school. I love my job and I am well aware how fortunate I am to be able to say that. It takes a special type of person to work with children and I am fortunate to be surrounded at work by people who likewise love their job. Within a Montessori school you get to develop strong connections with families; people are literally entrusting you with their most precious treasure. Most of the families that come to us haven’t just enrolled their child in the school next door but have taken time to investigate all the alternatives before they send their child to our school. And of course then there are the children. I often joke that the children keep you young but the job can age you, but it is true. There is nothing comparable to the way children open themselves up to you and share with you the joy of learning. No matter what the day, there is always some reason to smile. If you are interested in Montessori I would advise you to spend some time in a Montessori centre and to see for yourself. Reading about it is one thing but for me I also need to be immersed in it. For all the above reasons I love my job but just as I advise parents to find the school that best matches their values, so to is it the same for teachers. Find the job that uses your strengths but also challenges you, while supporting you with those challenges. If you think teaching might be that job, find the philosophy and then the school that matches your own teaching philosophy that you enjoy walking into and spending your day, that allows the children and adults to grow in a nurturing and respectful environment.